A while back I saw a YouTube clip where a woman phoned up on one of the Islamic Television channel. The programme was on the unseen world, namely the world of the angels and jinns. Anyway whilst talking on the phone this individual started to act strange. Strange in the respect that her voice would uncontrollably change into a low howling sound followed by a series of screech sounds. A sound similar to someone in the throws of severe pain and agony. So, this woman would initially travel in-between these rather strange sequences of noise. At the beginning the presenter as well as his guest on stage began to dismiss her as a nuisance. A person just being silly and were about to dismiss the phone call. At times she would talk normally and all of a sudden start laughing! When the woman during one of her strange experiences only slightly managed to say the words ” I’m sorry for this, but I cannot speak to you freely as they won’t let me… They are interfering in this conversation so that I cannot speak”. Once she managed to squeeze these words past her sounds of howling and screeches like that of a banshee. The presenter aswell as the guest on stage (who happened to be a jinn master). – A person who was a exorcist, a person who performed ruq’ya (according to the sunnah) Started to take her seriously. Maybe she was a person really possessed and this was not a joke? Immediately, they began to read the relevant ayahs from the Quran in hope that these jinns could leave her alone at least for the time being whilst she is on the phone. As soon as the presenters began to read these ayahs and remind the jinn possessing the woman to fear Allah and prepare for the day of judgement. There came a whimpering and crying sound from the other side of the phone. It was the creature – the jinn howling (crying) at the mention of Allahs name and of the day of judgement. Now, this sound was not of a human’s (voice) sound… It was more of a creature who was in great pain and remorse. In this state the sounds/cries continued. After a while the woman seemed to have over come her attackers. She then (when she regained her strength) told the full story of how the jinn came to posses her body. The reason for it possessing her etc. Once the case was clear the jinn master (a person who performed ruq’ya,) then made dua and asked Allah several times to help her when suddenly the phone line cut. Anyway, my point for this is that the prophet (saw) gave us some prophetic dua’s (azkars) to protect ourselves from such evil attacks like that of black magic. He (saw) instructed us to read these specific dua’s morning and in the evenings – morning (after Fajr) and evening (after magrib). What these specific azkars do is they become a shield for anyone who reads them… From morning to evening and then from evening to the morning. Then with Allah’s help no black magic or any such thing will harm the individual, man or woman. Unfortunately, many within the Muslim ummah are oblivious to these treasures. Hence therefore go to deviants and apostates for help. At times doing great things to receive cure. Many a times they pay a lot of money. If only they were clear on these azkars and new about these treasures and the benefits (virtues) they have. For example there is one azkar which if read 3 times in the morning, seventy thousand angels do dua for the person who read it, until the evening and vise versa. From the evening to the morning – if he reads it in the evening. To know more about what these dua’s (masnoon azkars) are, feel free to contact me. Generally speaking these can be found on any dua books e.g the fortification of the Muslim. However not all are mentioned in these books and the virtues of each of them not highlighted either. 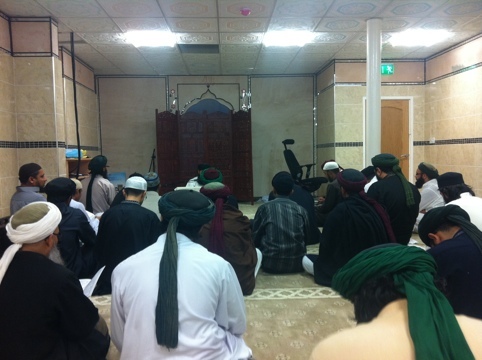 brothers reading sunnah azkars after Fajr, in the company of shaykh Ahmad dabbagh. following the sunnah… Reviving a sunnah. Alhamdulillah.